General guidelines: To re-educate chronically tight muscles it is imperative that while stretching there is adequate blood flow going to the deep part of the muscle which is generally where the worst part of the strain is. Ideally, THE STRETCH SHOULD BE DONE WITHIN 5 MINUTES AFTER EXERCISE OR ACTIVITY. Even 5-10 minutes of steady activity around the house or office will help warm up the muscle so that you can get the maximum benefit of the stretch to the deep part of the muscle before it has a chance to cool down. This will insure that as the muscle cools down it doesn’t keep returning to the same set point over and over. It is ok to stretch before getting out of bed in the morning. This is a great way to loosen up and get the day started but it is not as effective for re-educating muscles as doing it after activity. FREQUENCY : THE FIRST 2 WEEKS DO EACH SIDE FOR 10 SECONDS AND THEN REPEAT ONCE. It’s important to get your body used to the feeling of the stretches and to get into the habit of doing it daily. As you get more comfortable with it, I would encourage you to stretch it longer (up to 30 seconds) if you have the time and/or it feels helpful. Most people won’t stretch indefinitely twice daily so after two weeks going to once daily is common. 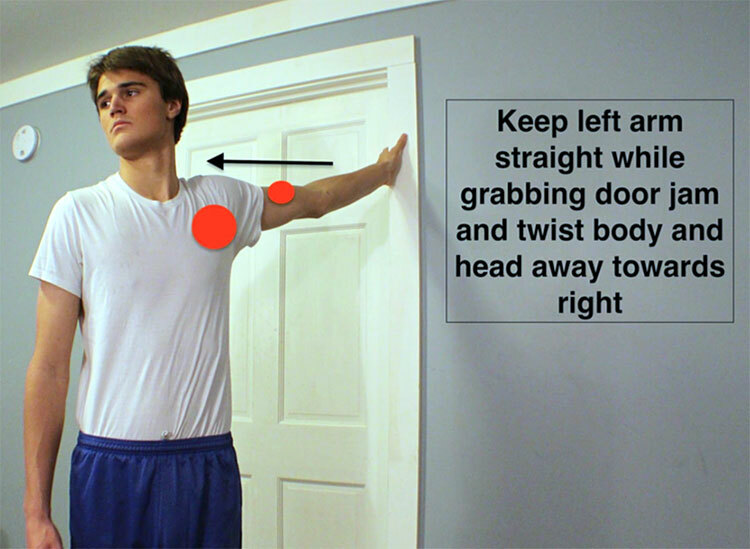 Directions: With the arm outstretched at shoulder height GENTLY rotate away from the arm until you feel pulling in the chest and/or biceps (upper arm) area. If you are having shoulder/rotator cuff problems only raise it as high as feels comfortable. Most people will do this stretch at 2 or 3 different heights to stretch different parts of the chest muscles. Stretching during the exhalation phase of breathing can also make this stretch more productive. WITH THE ARM BENT, IT WILL ISOLATE THE CHEST MORE. 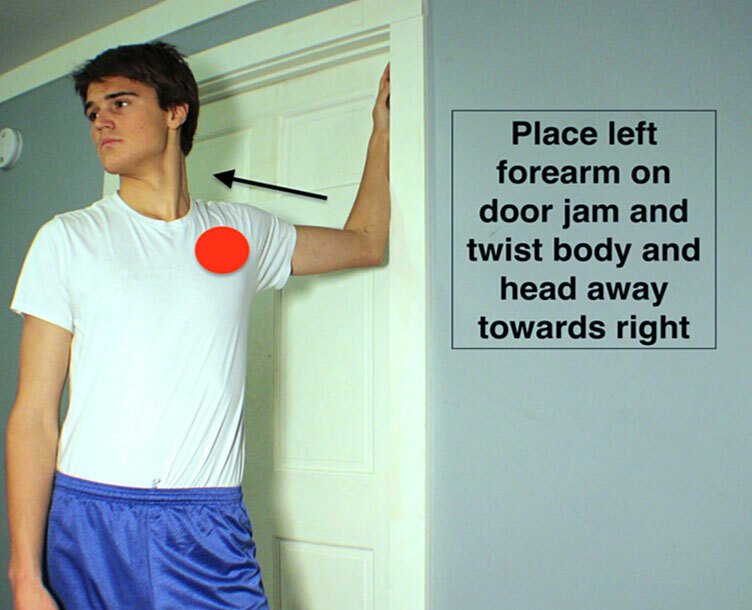 Try different levels of arm placement to stretch different sections of the Pectoralis muscles. Be careful not to overstretch it during the first few days by stopping the stretch at the first place you feel it pulling in the chest muscles.